2006-04-27 – Washington, D. C.
Men and women of different religions, from the different continents of this world, we have gather in America for the first time, guided by the spiritual energy of the "spirit of Assisi." Here in Washington, D.C., we have prayed, we have dialogued, and we have invoked God for the great gift of peace. We have also listened to the prayers of the many who ask for the globalization of solidarity; we have heard their cry that asks for the scourge of poverty to be defeated. Through the testimony of many people, an invocation has reached us. It comes from the victims of violence, and from the victims of terrorism and war; it rises from those who lack even the most basic human rights, the right to medical care, to water and food, and to religious freedom. We have felt that a world in which billions of human beings struggle to survive is unacceptable, at a time when humanity has more resources available than all previous generations. We have come here, men and women, as pilgrims in search of peace. Our world seems to have forgotten that human life is sacred. God has compassion for those who suffer, those affected by war, and the victims of blind terrorism. The world is tired of living in fear. Fear humiliates the best part of us. Fear and pessimism sometimes seem to be the only way, but they lead down a dark road. 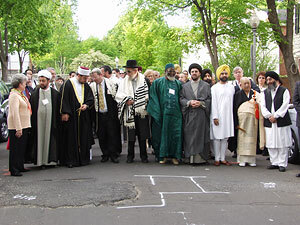 Religions do not want violence, war, or terrorism; do not believe those who say otherwise! To all our fellow religious people, to every man and every woman, we want to say that those who use violence discredit their own cause. Those who believe that greater violence is the response to the wrong they have suffered do not see the mountains of hatred they help create. Peace is the name of God. God never wants the elimination of the other; the sons and daughters of our adversaries are never our enemies: they are children to love and protect, all of them. Humanity is not made better by violence and terror, but by faith and love. Fundamentalism is the childhood disease of all religions and cultures, for it imprisons people in a culture of enmity. This is why, in front of you young people, we say to those who kill, to those who sow terror and make war in God’s name, "Stop! Do not kill! With violence everyone loses! Let us talk together and God will shine on us!" Only peace is holy! Let us have and advocate serious, honest dialogue. Dialogue is an art. It is not the choice of the fearful, of those who give way to evil without fighting. Dialogue challenges all men and women to see the best in others and to be rooted in the best of themselves. Dialogue is a medicine that heals wounds and helps make this world more livable for present and future generations. Once again, today, we solemnly ask ourselves and all men and women, believers and people of good will, to have the courage to live the art of dialogue. We ask this for ourselves and for the generations to come, that the world may open to the hope of a new era of peace and justice. Proclaimed and Signed in Washington, D.C. This entry was posted on September 29, 2009, 1:51 pm and is filed under Catholicism, Christianity, Gospel, Islam, prayer, Protestantism, Religion, Religious Tolerance, Social and Politics. You can follow any responses to this entry through RSS 2.0. You can leave a response, or trackback from your own site. Wow! I won’t try to add anything to that. I would only diminish it. Yeah, that’s why I didn’t do anything except cut and past it. Although I do like that line (which is why I high-lighted it and used it as the post title) about fundamentalism being like a infliction that immature believers are prone to. That certainly was the case for me. I wonder why so many stay ‘stuck’ there for years and years and can only surmise that they choose to stay there out of fear. Fear of slipping up, fear of making God mad. Fear of hell. Ah, yes. Your religion is too uncomfortable for me, therefore you and those like you are . Yeah, that’s the ticket. I left fundamentalism behind a few years back over issues relating to young-earth creationism. The church I attended took a simplistic and overly literalist view of Genesis. They asked me to leave because I didn’t share that view. That’s wrong, but it’s no more ‘immature’ than saying that there is no such thing as hell. Do you ‘mature’ in your faith when you can say that all religions are equally valid and equally true? Hardly. I wouldn’t equate particular beliefs to levels of spiritual maturity. Spiritual growth and maturity only comes from studying the Word, spending time in prayer, and living a Christlike life. Now don’t go gettin’ yourself in a snit, Steve. No one here is saying that believing in a 6,000 year old Earth or in a place called Hell or any one of a number of things, amounts to ‘fundamentalism’ (although the founders of the American Fundamentalist movement would disagree with me here). But to insist that someone must believe in those things or else they are not worthy of being called a Christian or that their beliefs are thereby ‘apostasy’ – that might just qualify for the contemporary definition of this title. And it certainly is not a very mature position to state that all beliefs are equally valid. One does not need to deny their own faith to see that other faiths may have some, even great, value. It’s certainly of value to them. It’s not a matter of syncretism, its simply a matter of showing some respect for people who encounter God differently than ourselves. So, by your deliberately limited definition of the means towards spiritual maturity, can only Christians attain it? I agree that prayer (whatever that might mean to an individual) and trying to be Christlike (even though you might not encounter Christ through Christianity) are two pretty important elements. But can’t Jews. Buddhists, Hindus and Native Americans be spiritually mature without the Christian Bible? How did the people in the Hebrew Scriptures ever mature spiritually, without access to the scriptural accounts of themselves?